Despite the rapid spread of democracy, and the corresponding political enfranchisement granted to more individuals than at any time in history, these gains are being undermined as the world descends into two camps, those who are economically enfranchised, and those who are not. Economic instability has been a permanent feature of the global economic system in which we all live. Rather than deal with these problems before proceeding with the process of globalization, the very visible hands that control the global economy continue their breakneck pace of opening up domestic markets, and societies, to market penetration. The democratic political systems that humans have created for the betterment of society have not yet been extended to the economic system. There is growing unease among a very large sector of society the world over that globalization is forcing us to live in an economy, rather than live in a society. In order to develop appropriate responses to economic crises, and strategies for dealing with the process of economic globalization and the decentralization of government, we must begin to understand economics. Rather than subscribing to the dominant methodology and ideology of economists, with their formulas and abstract language, we must start from our communities, and from our own lives, using normal language to express what we know to be true. The following is a brief, simple introduction to money and the economy, presented in a way we hope will help you to understand how it functions, what the problems are with it, and what we can do to change it. An Economy is nearly everything that we do. An Economy can be scaled geographically. The majority of all trade takes place at the local level. incomes are increased to match growing expenditure. An economy are the sum of the activities we all do to get what we need, which takes place within a certain area. We must make some good or perform some service, and we must deliver it to our customer. An economy is like a barrel, with money flowing in and money flowing out. We receive income, and we spend it on things we need, and on things like taxes. Our community receives income from goods and services we sell to other communities, and we spent it on things like schools, electricity and roads. Our country receives income from goods and services we export to other country, and spends it on things like government, health care, education, courts, the police and the military. The things we do for money, for example working at a job or managing our own business, are like little barrels inside the big barrel of the community economy. 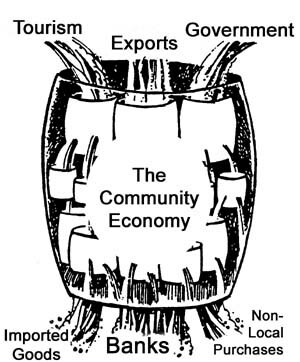 Similarly, each community economy is a little barrel inside the big barrel of the national economy. The national economy is a little barrel inside the big barrel of the global economy. If we look at the economy this way, we see that we always need to have enough money coming in, as we see draining out. 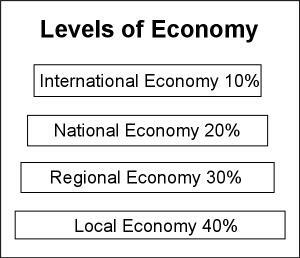 Economists see no difference between the economy at the international level, and the economy at the local level and all the levels of economy in between, although they are very different. They do not see that an economy has levels. We do the majority of our trading at the local level because it is cheapest and most convenient. However, economic rules decided at the international level determine how our economy functions at the local level. It should be the other way around. Thus, the government and most economists are focused on bringing more money in, not on how to keep money from flowing out. Rather than trying to catch as much of the “water” flowing in as possible, only to watch it drain out, it’s better to focus on how to keep money in our community longer. If we do so, our economy will be stronger than if we focus on bringing money in, by cutting down our forest, harvesting our resources, building a dam, or performing our culture for tourists. These are but short-term measures, and they will not help us to survive an economic crisis. To be strong, we have to think long-term. We can think of this new economy as connecting our barrels together, so that our money flows to each other rather than out of the community. The longer money stays in our community, the safer, stronger and healthier our community will be. There is a way we can do this: by creating our own money. Economic instability, inflation, unemployment and poverty are permanent features of a global economic system which alleges to be free-market but allows certain monopolistic activities to remain. Namely the exclusion of the single most important regulator of the market economy system: money, from itself being regulated by the market process, and controlled by the people who produce. Money has no value in itself - you can’t eat it, wear it, or build with it. It’s only useful to get real things - like bread and butter, tools and training, arts and crafts, haircuts and houses. It is used to measure value, and nothing else. Money itself is just a set of tickets, usually issued by the government when they borrow us all into debt. Often it’s only a number in your bank account, a score on a score sheet, nothing more than a measure. There will always be times when real things are scarce; we can be short of bricks, out of fuel, the harvest may be poor, there are ony so many hours in a day. Yet we are often idle, unable to work or trade with each other, when there are plenty of real things - materials and equipment, skills and time, goods on the shelves and needs to be met - simply because there are no tickets around, no scores on the sheet, no way to measure and thus record the fact that the exchange took place. People around the world are realizing that we have the power, and the right, to re-arrange the economy in a way so that all our needs are met. Economies were first designed to serve humans, to make it easier for us to get what we need. Originally, there was no such thing as debt, and the same idea continues to this day, among our friends and family. Do we charge our friends and family interest on the money we lend them? No! For thousands of years, economies were stable and in harmony with the natural environment. Then a dangerous idea started when dictators wanted to raise money for war, and strangers wanted to profit from each other: interest. The paying of Interest treats us all like strangers, enslaves us to the economy, to money and to those who are rich and powerful. After every major monetary crisis since 1820, communities have issued their own money as a community-based response. The great cathedrals of Europe, the wealthy city-states of Hong Kong and Singapore, as with ancient Athens, are the result of organizing economies at the local level. Today, there are an estimated 3,000 Community Currency Systems (CCS) in 35 countries. Creating our own money will help us to organize the economic activity of our community better, and will give us the economic enfranchisement that we need in order to be full members of a democracy. Now that we have stripped away the illusion of money as something having power over us, and the illusion of a market as something that we have no control over, we are ready to take matters into our own hands. It makes very good sense. community best, we know what’s best for our community. We produce the wealth in this country. Why Create Our Own Money? If the regular economy suited our purposes we wouldn’t need to. As we have seen, they can’t help it, it’s just that there are some contradictions that remain unresolved, and until such time as they are resolved, and money and the market are designed to suit our needs, we have to do things for ourselves. It’s not that economic planners are not good at what they do, it’s just that they lack the accurate information needed to make good decisions. They don’t know what it’s like in your community, so how can they make important decisions that will affect your life? We know what’s best for us. All the problems in the community that are caused by just a lack of money can be resolved by using a community currency. Whether communities are large or small, rural or urban, whole regions or neighbourhoods, students in a school, colleagues in an office, club members or community groups, in the rich countries or in the poor ones, community currencies will increase our ability to help ourselves by helping each other. It is our work that makes us, our community and our country rich. We should be able to use money to our advantage, and for the benefit of our community. The people who now live in poverty at the bottom of the economy, like our farmers, our cleaners, our educators, our community workers, the women in our community, are the real wealth producers. But the work they do is not being compensated properly because the economy is not controlled by farmers, community workers or women. We have a right to choose our way in life. Money, as an instrument that we have created for our benefit and not something created by an “invisible hand” or a magic wand, is supposed to serve us. But national money works the way it does, and so in the meantime we need another means of exchange to fill in the gaps that the present economy leaves us in. Community Currencies are simple, safe, sound and democratic community accounting systems. They are defined as “systems of accounts which allow their members to issue and manage their own money within a community money system.” Thus, community currency is personal money that only circulates within the community. They represent contributions made to the community, from which the holder of this currency may expect compensation at a future date in the form of goods or services available in the community for community currency. They are a secondary money system, operating in parallel with the national currency. They build a strong community economy, on which a strong national economy is founded. Community currencies are not designed, nor intended, to replace national currency. For most transactions, people use both the community and the national currency, as some of the costs are often incurred in normal money - for instance when goods have to be brought into the community. Generally, everything can be available, at least in part, in the community currency, according to the proportion of its cost that is value-added locally - the local wages and resources that are part of the selling price. The money supply of a Community Currency System is mutual, which is to say people withdraw money on credit from the community for spending with others, and agree to receive that amount as part of their personal committment to the community. It works just like a credit union or a bank, except that you withdraw different colored tickets from your account. Every amount you spend in community currency cannot leave the community, employing local people - helping others - employing you yourself. The system is managed by its members through full and open democratic processes, the same as with a Credit Union or cooperative. If we keep our money circulating locally, it means that we need less inputs from outside the community. It’s ours, so why would we want it to leave? That is what the national currency is for, for buying those goods and services we cannot produce ourselves locally. If we use community currency for many of our purchases, we will be able to save national currency for when we need to buy something outside of our community, or for the future. When we say that community currencies are interest-free, we really mean it. We want you to save your national currency, but we want you to spend your community currency, so we are not going to pay you to save your money. In times of economic crisis, the last thing we want is to see money being saved, the key to economic recovery is spending. Besides, if it’s your money, why would you ever charge yourself interest? Unlike the international “free-market” economy, where those with capital dominate the market freely, this is a truly free-market mechanism. It’s free to anyone living in the community who opens an account, or who is simply willing to receive and spend the community currency. Community Currency is issued by the person who has an account in the system. Thus, this money is actually theirs. The organization does not issue currency at all, it only manages the accounts for those who have issued currency themselves. Thus the money supply accurately reflects the ability of community members to produce, and as the money supply always matches production, there is never any inflation. As we have seen, national currency is scarce. In resolving this situation, we definitely do not want to create too much money. There is no advantage for you to take out more than you need to, so why would you? In some cases, there are credit limits and charges just to be sure. We know that national money is scarce, even more so after a Monetary Crisis, because that’s the only way the government can maintain its value on international markets. That’s fine for the value of the currency, but what about us? We need a currency that is going to fill in the gap between the scarcity of national money, and our community’s productive capacity. As long as we have people, resources and needs, we have productive capacity.An economy needs people who need something. If we don’t need anything, then we don’t need to trade anything. To make or do something, we have to have skills to offer. Everything we do involves skills. To make something, we need resources to make this something with. Services sometimes, but do not always, need resources. If we have no time, we can’t produce anything. We need to set aside some time for producing. Economics, like politics and law, were formerly the exclusive domain of economists, with their tricky formulas, special language and difficulty grasping simply realities. In the last 60 years, however, we have made great gains in democratizing the study and process of economics. The recent protests against the World Trade Organization, Asia-Pacific Economic Cooperation, World Economic Forum are the culmination of many years of hard work, and the understanding that economics is the last major field to be democratized. Economics should no longer be the “study of scarce resources” as it was when resources were indeed more scarce than they are now. Today, we are awash in consumer goods, and enough food to feed the starving millions is dumped and left to rot in order to keep prices up (by keeping food scarce). The problem is no longer one of scarcity, but of distribution. We think goods are scarce because we have to compete for them. If we cooperated and shared, we would soon realize that we have enough for all. So those who want to control us want us to compete. Our analysis above demonstrates that the present economic system is unstainable, and thus we can predict a future economic crisis. The solutions we design must be sustainable for the long-term. Rather than looking forward, it means we need to look back, to see how our ancestors were able to live in harmony with the natural world for many thousands of years. More than just sustainable, the new economy must be ecological, recognizing that that economy is a closed system, not a flow-through system with inputs (natural resources) and outputs (waste & garbage). The political enfranchisement that is sweeping the world must be extended to the economic sphere. The right to vote means nothing if we are dependent economically on others to eat. We need a say in how we are governed, and a say in how we fit in the economy. We can only do this from a position of equality. As long as money is not ours, we don’t have a leg to stand on. Stability is essential so that we can make long-term plans. The current short-term economic view is behind the economic instability we see. All of the greatest activities, buildings, ever carried out by humans took a very long time, much longer than the present scope of economic thinking. We need a stable economy. Our best resource is ourselves: our skills, experiences, and time. We humans have proven ourselves to be very resourceful if the material resources we need are lacking. We don’t need to back money with anything more than the promise that we will make up that value, and we deliver that promise on demand. The best economic decisions are those made by us, together, in our own community, based on our own reality. We know what we need, and we know how to meet our needs. We don’t need anyone else to tell us how to do this, but we can learn from the experiences of others. Economic decisions which don’t take in everybody’s opinion are not good economic decisions. Young people are the future, they must have a say in what is being done today. The elderly, with their years of experience, must also have a say in how things are being managed. Everyone needs to have a say in the decisions that affect their lives. Community Currency Systems share many of the same principles as new economics, but are more specifically oriented to individuals who wish to issue their own money into their own community. Anyone may choose to join the CCS. Community Currency Systems conform to national,regional and local laws. Community Currency Systems operate only within the bounds of existing national law. Community Currency Systems are parallel currency systems,in which the community currency functions in complement to the national currency.CCS are not alternative currency systems. Each member has the right to vote and participate in the CCS. Each member has only one share,no matter their investment or position. Community Currency Systems are autonomous systems,and may choose to join inter-local trading networks of their own free will.Autonomy and independence from politics and religion. Focus not only on members but on the whole community. Ownership and responsibility of money rests with the person who issues it.Community currency is the property of the person who issues it.They decide to withdraw it,and they back it with their willingness to receive it at any time. Members with balances that are too high,or too low,may be noted publicly so that the others may help them spend their balance down,or earn their balance up. CCS is focused only on the locality or community in which it operates,as defined by the members of that system. Profits are used to improve the system and community.Community Currency Systems are not-for-profit organizations,in the same way as Credit Unions.Any income generated pays for internal costs,provides for adequate savings in case of emergency,and for the people who manage it. Each member may know the balance of another member,and the summary of system information.Operations are open for viewing by all members,and monthly summary information is publicly displayed.Any member may know the turnover and balance and trading activity of any other member,at any time.This is so that each individual is personally and collectively responsible for the proper function of the system. All accounts are kept in individual and system ledgers.Individual Account Ledgers and the System Ledger must be maintained at least on a bi-monthly basis.The administration of a CCS does not and will not issue any currency into the system. 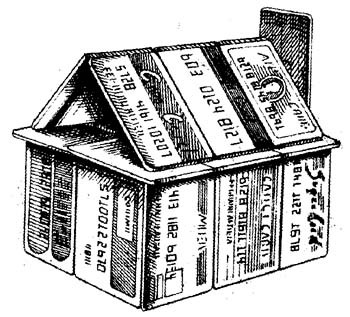 Community Currency is always issued as credit through accounts,and not handed out to members when they join (unless this act is recorded in the accounts).The system ’s Debit and Credit balances are always even and the system is always balanced at zero.The administration of a CCS does not and will not issue any currency into the system. Community Currency is always issued interest-free.However,there may be a usage fee applied only to positive accounts (ie.those that have money rather than those who don ’t). The contradiction between the function of National Currency as a standard of value and unit of exchange means that the supply of national currency is not sufficient.Community Currency Systems seek to rectify this by providing a sound method for issuing a sufficient supply of money into the economy.A sufficient supply is determined by the member,within limits set by the community. As national currency,created through borrowing by central banks,is a debt-based money,the money supply is constantly expanding.Community currencies represent the actual human and material capital in the community and thus are non-inflationary. Community-Currency systems are based on community,and thus the currency is limited to the community,as defined by the community.They may also be geographically limited to a particular local area. 14.Economic and social empowerment of members. Community Currency Systems give members the opportunity to identify community assets and capabilities,as well as needs for developing those assets and fulfilling capabilities,with an aim to ‘satisficing ’ ((Herman Daly, Steady-State Economics),to sufficiently satisfy basic needs and simple wants. CCS members are encouraged to educate themselves.The best way to help people,is to help them to help themselves.CCS promotes self-education, self-reliance and self-discipline. We help ourselves by helping each other.Community Currencies Foster Social Reciprocation.By stating what one is offering or requesting,assets and needs can better be identified and mobilized for community benefit. We are the main actor in our improvement.Community Currencies Foster Local Self-Reliance.By focusing solely on local economic and social activities,the intention of Community Currency Systems is to foster Self-Reliance, while recognizing inter-dependence among individuals and communities. Community Currency Systems aim to meet human and community needs in a way that is loyal,simple,playful with the purpose of enriching each of its members socially,culturally and spiritually,not just materially. Community Currency Systems respecting the ecological riches and diversity of the local region.They do not support unsustainable use of resources and instead work to increase natural capital. Community Currency Systems are independent systems and will be vigilant against being dominated by any political parties,churches or sects. As systems that are not dominated by one group,they respect the diversity of the whole community. 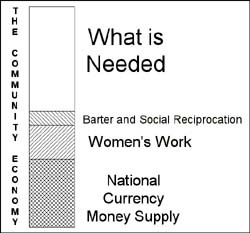 Creates the space and opportunity for individuals and the community as a whole to re-assess the values of the goods and services available in that community.Through this process,traditionally undervalued activities,such as the work of women, may gain greater significance and respect. Community Currency Systems endeavor to provide the foundation in which local communities can weather economic crises caused by external factors (global booms and busts)through mutual support. By focusing on basic needs and abilities of people in a community area, Well-Being is enhanced as a result. Everything may be considered inside the scope of the CCS,expressed through the voices of each member of the system. Men and women share equal burdens in the system. Members are encouraged to educate themselves to improve their economic and social well-being. The goal is for all members to benefit,by giving what they can,and receiving what they need.